DJI has revamped most of its drone series’ this year. None more so than the Phantom series. We saw replacements for the Phantom 4 and a new Phantom 4 Pro. While the original Phantom 4 Pro looked very much like the original Phantom 4, the Obsidian Edition brings a new Stealth Bomber colour scheme. But can the technology inside this newer drone match its new lick of paint? How does the Obsidian differ from the Phantom 4 Pro? The Phantom 4 Pro Obsidian looks the same as the regular Phantom 4 Pro, except for one major aspect: it’s black. This might seem like an unimportant cosmetic change, but it does mean you can see it more easily against the sky when the drone is in flight. It seems kind of obvious, but the sky is generally bright and clouds are typically white on a good day. So remaining on the ground, facing up at the heavens, while flying a white drone can lead (often) to losing sight of it quite easily. This is especially true if you accidentally fly it directly between you and the sun, or just quite far away from launch. With the Obsidian edition of the Phantom 4 Pro, this was rarely an issue. The dark grey/black colour scheme makes for a more easily visible silhouette. Unlike the Mavic Pro, the Phantom 4 Pro Obsidian is a large, fairly rigid drone. There aren’t any folding parts, meaning you need to carry it around in a rather large protective case that’s hewn from a chunk of dense Styrofoam. In order to keep things from getting insanely difficult to transport, DJI had the wisdom to make the rotor blades removable, like previous generations of this drone. When you take the Phantom 4 Pro out of its case to go fly, you attach these blades, then detach them when you’re done. It’s a minor inconvenience, but one thing you don’t ever have to do with the Mavic Pro – unless a blade breaks and needs replacing. 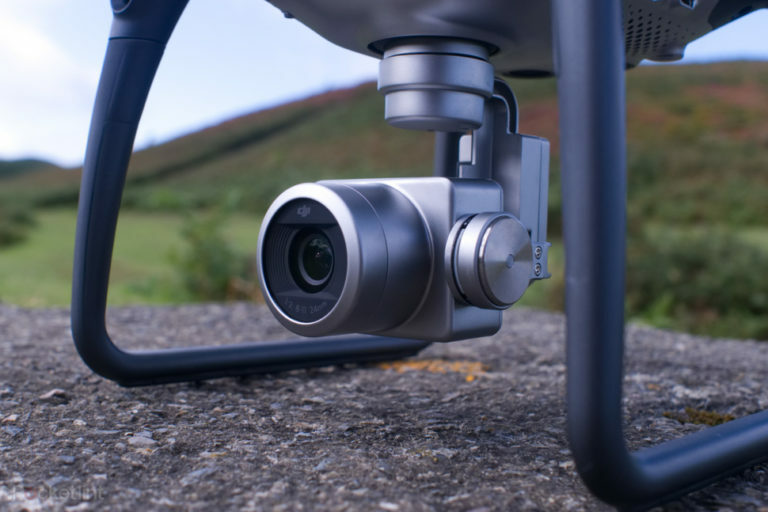 Despite its size, the sumptuous curves on top and beneath the Pro 4 give it an attractive look, while the slender legs provide a sturdy base for the drone to stand on, and give the under-hanging magnesium alloy-clad camera the space it needs. One thing you will notice around the drone’s body are a number of small blacked-out areas and circular sensors. There are two cameras built into the front legs, two on the rear, and a couple on the underside. In combination, these six cameras give the drone its 5-direction obstacle avoidance. The back of the Phantom 4 Pro Obsidian is where you’ll find the removable battery. It has the usual set of LED lights, and the LED ring around the power button on the outside, as well as grippy rectangular buttons on top and beneath. These buttons, when pressed in unison, release the battery, so that you can slide it out for recharging. Does the DJI Phantom 4 Pro come with a controller? Depending on which 4 Pro package you end up buying, the flying experience will be slightly different. The Pro+ package that we tested costs £230 more than the standard package, but it comes with a screen-equipped remote. Otherwise you’ll have to use your smartphone as a remote, via an app. The entry Phantom 4 Pro comes with the basic remote that needs a phone to view the live video feed. In our experience, paying the extra is a no-brainer. Having the screen already there means no fiddling around trying to get your phone plugged in and secured into a grip. It also means you only have to worry about two batteries draining – not three. Despite its professional qualities, actually flying this Phantom 4 drone is relatively easy. After all, the high-tech sensors mean that the drone does all the nitty gritty hard things for you. In other words, you let go of the controls and it’ll hover in place without being bothered by the wind (presuming you don’t try and fly it in gusts over 22mph). 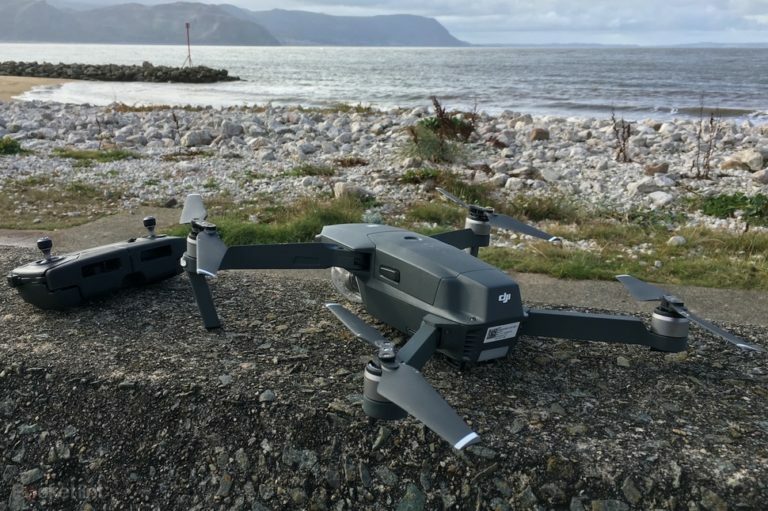 We tested the Pro 4 in some very strong mountain winds and, while it stayed airborne, it struggled to hover in place – instead it constantly drifted. So, yeah, don’t do that. Controlling the Phantom 4 Pro uses a combination of the traditional joysticks, buttons and scroll wheels on the remote and the touchscreen-based user interface. 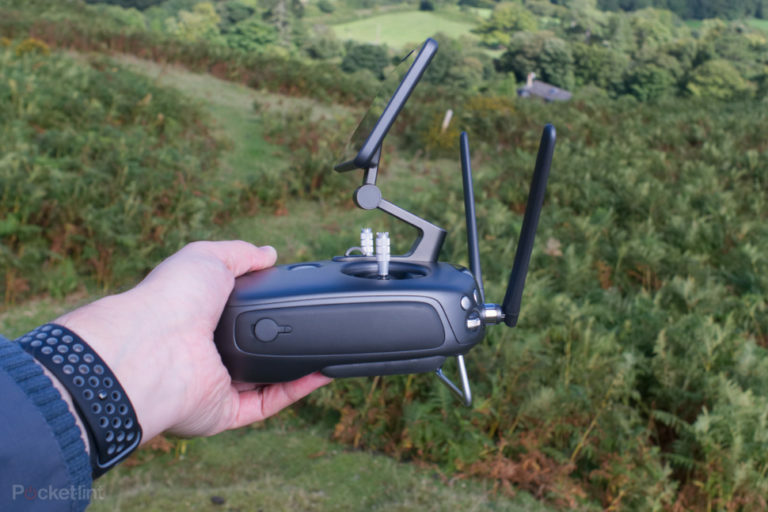 For basic controls – taking off, moving the drone and adjust the camera angle – you can use just the physical remote, using the screen purely as a live video feed. For more advanced features – like the various flight modes – the touchscreen is indispensable. From the touchscreen you can choose which of the ActiveTrack modes you want to use. This tracking mode feature is where you can draw a rectangle target around a person or object to have the camera or drone to follow them. You can also use a Draw mode – where you literally draw a route with your finger on the screen, tell the drone how fast to fly, which it then follows. 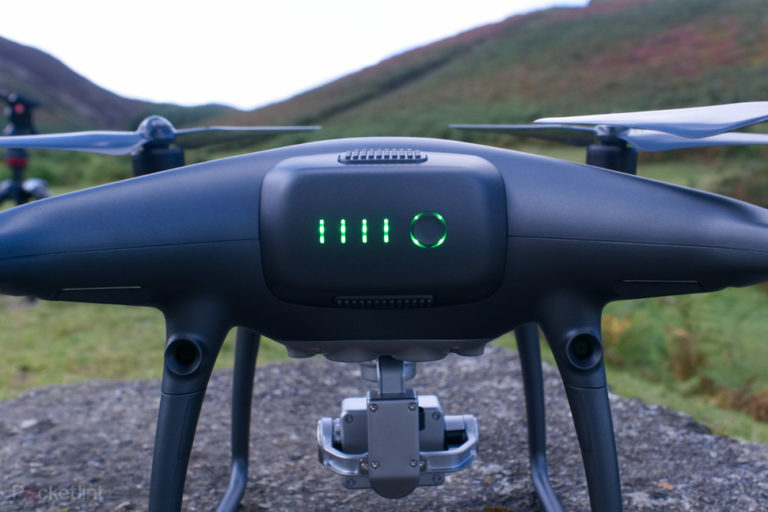 There are many other flight modes, too, such as the ability to set a point of interest and have the drone circle around it, or TapFly which allows you to tap on any point visible on the screen and for the Phantom to then fly to that point. Of course, there’s the now famous Return To Home feature, which does exactly what it says on the tin. Once activated, the drone flies back to its recorded home point, hovers to find its precise take-off position and then lands itself. All you’ve had to do to activate this is either press a button, or slide your finger on the screen. One thing that impressed us most about the drone’s various flight modes was how well they all worked in testing. Not one of the various methods of flying or tracking failed seriously. ActiveTrack precisely followed what we told it to follow, and the only real issues arose when the person it was following was partly obstructed from view. Once they came back into view, the ActiveTrack system was able to pick them up again fairly reliably. Similarly, the Draw mode worked flawlessly, smoothly following a virtual line we’d drawn on the screen. Similarly, every time we tried the Return to Home feature, the drone landed precisely where it had taken off from, within centimetres, and this in an area of grass which was seemingly indistinguishable from the rest of the area it was in. How long does the DJI Phantom 4 Pro last per battery? Perhaps the most important improvement in the Phantom 4 Pro, however, is its battery life. In DJI’s sterile, windless testing environment, the Phantom 4 Pro can last 30 minutes of flying. In real life, you’ll get less time – but still much more than we were ever able to achieve with the Mavic Pro or tiny-scale Spark. 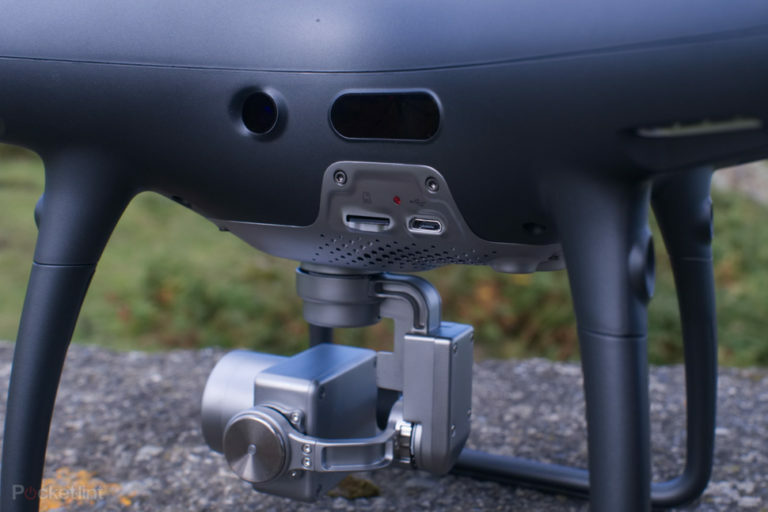 Even with slight wind, while testing various flight modes and with almost constant video recording, the 4 Pro was capable of lasting 20-25 minutes per battery in our use. Get a spare battery and you’ll have the peace of mind that comes with knowing you can fly for almost an hour, without having to worry about getting that anxiety-inducing “low battery” warning. How good is the DJI Phantom 4 Pro’s camera? As drone cameras go, the Phantom 4 Pro’s is among the most impressive in the spec department. It has a 1-inch CMOS sensor which boasts 20-megapixels and the ability to record at various resolutions, up to 4K at 30 frames per second. 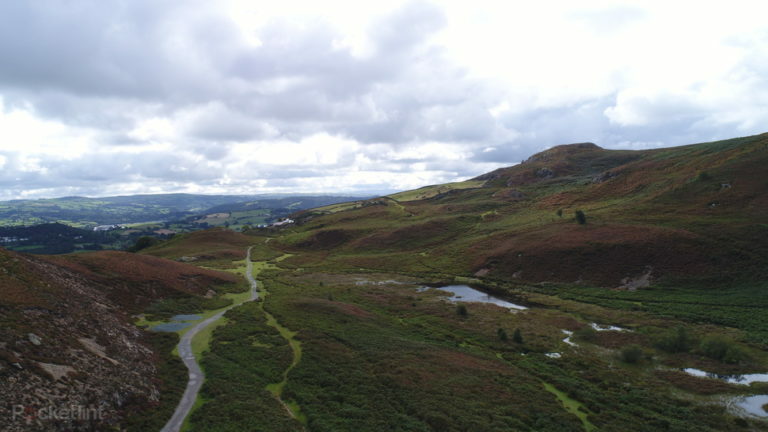 It’s the end result that are most important, though, and in our testing we find its results to be among the best looking footage and stills we’ve seen from a drone camera. That’s perhaps not a surprise given just how much larger a 1-inch sensor is than many smaller-scale competitors. Still photos are vibrant and full of colour, which is exactly what you want when shooting cinematic landscape footage. Sometimes when shooting in contrasting light conditions, the 4 Pro struggled not to overexpose the highlights, while trying to keep the rest of the shot balanced. Even more impressive is video, because it’s so impressively smooth. Details are sharp too. This is thanks mostly to the gimbal system the camera is mounted on. Flying in some wind, the 4 Pro’s camera footage looks completely steady and shake-free; similarly, camera movements (even when you don’t feel like you’re controlling it smoothly) are silky smooth. 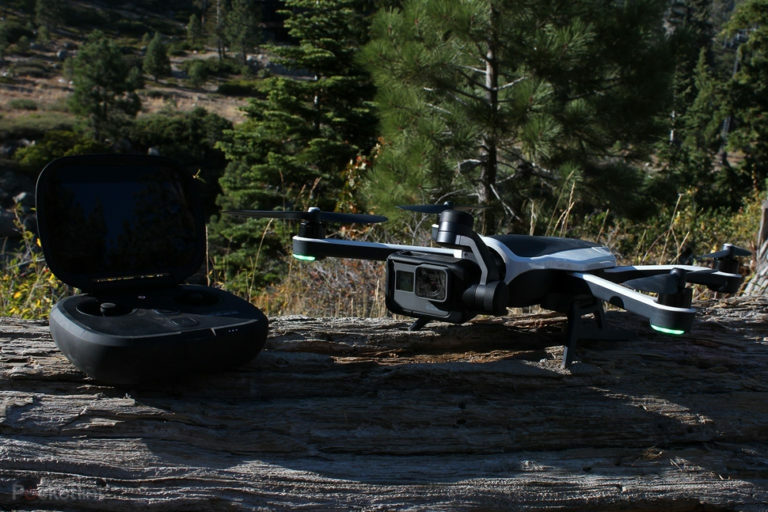 If you want the best consumer drone around, look no further. The Phantom 4 Pro might not be as nimble and portable as a DJI Mavic, but it makes up for that by being powerful, reliable and longer-lasting, too. Add stable, attractive and smooth results from the 4 Pro’s camera and you have a drone which feels impossible to beat at the high-end of the consumer drone market. It’s very impressive indeed. The Mavic Pro is less expensive, much smaller, and has a lot of the same flying capabilities as the Phantom 4 Pro. It may not last as long, or be quite as honey-smooth as the Phantom 4 Pro, but it will fit in your backpack and leave you with more money in the bank… quite a lot more money, in fact. 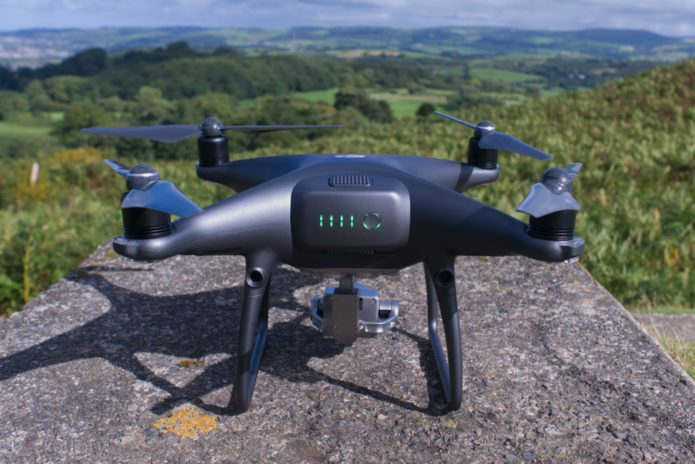 GoPro’s first drone is much more affordable than the DJI, especially if you’re an existing GoPro camera user. You might not get all the high-tech features of the Phantom 4 Pro, but you do get a drone that’s even more effortless to fly thanks to the super user-friendly remote control and user interface.